The Spanish region of Navarra lies between the Pyrenees to the north east and the River Ebro (and the region of La Rioja) to the south west. The capital of the region, the city of Pamplona (possibly best known for it'sanual "Running of the Bulls" fiesta, is located in the centre of the region and approximately one third of the regions inhabitants live there. Pamplona has been described as having one of the best standards of living of all the cities in Spain. 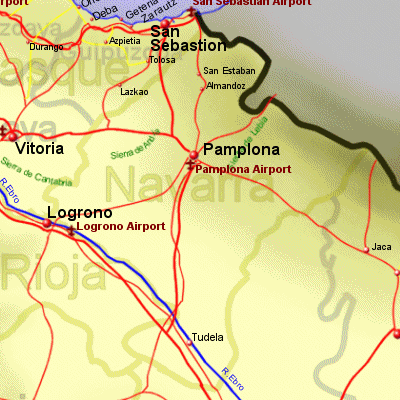 The topography includes fertile plains in the River Ebro valley, at around 350m above sea level where they grow wheat, vegetables and grapes for the local wine industry, to the 2000m peaks of the Pyrenees. The region has made extensive use of renewable energy,mostly wind farms but also some small hydroelectic and solar installations, and may have all its electicity produced this way by 2010 or 2011.